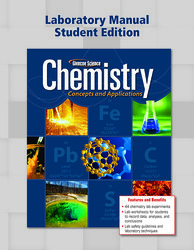 Offering 44 inquiry-based chemistry lab experiments, the Chemistry: Concepts and Applications Lab Manual incorporates both macro-scale and micro-scale labs. Two lab options are included for each chapter, along with lab worksheets for students to record data, analyses, and their conclusions, plus helpful lab safety guidelines and lab techniques. A Teacher Edition is also available.